In celebration of its 40th anniversary, the UMass Fine Arts Center is taking a unique performance on the road (literally) and bringing it to Brattleboro's October Gallery Walk, where it will be offered free to the community. The Bridgman|Packer Dance Company will perform their groundbreaking multimedia work "Truck." 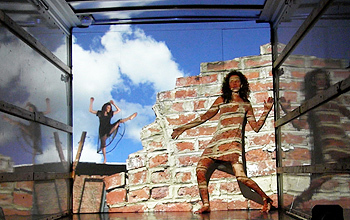 The performance is set in the back of a 17-foot box truck, with the audience viewing from outside. The truck will be parked in the empty lot at 21 Flat Street, right next to the Brattleboro Boys & Girls Club. Performances last about 15 minutes and will begin at 7:00, 7:25, 7:50, and 8:15 p.m. Due to sightlines, audience capacity is limited to 100 people per showing. This work is suitable for all ages. 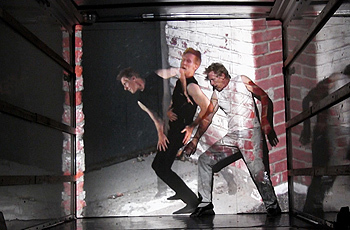 Renowned for their unique approach to integrating live performance and video technology, Bridgman|Packer Dance incorporates simultaneous computer video processing with time-delay and image-altering capabilities. Multiple video images appear and evaporate in response to the performers' movements, and evolve from photo-realism to strokes of abstraction. With constantly changing scenes that shift in scale and perspective, the work ranges from evocative to humorous, to sensuous, to wacky. This performance would not be possible without the enormous generosity of so many Brattleboro people through their donation of time, space, energy, and more. Thanks to the Arts Council of Windham County, Brattleboro Town Arts Committee, Susan Rosano, Dr. Samantha Eagle, Peter Johnson of Emerson's Furniture, Joy Wallens-Penford of Gallery Walk, Charlie Chandler of Chandler Electric, David Ward of Green Mountain Power, and the Latchis Hotel.